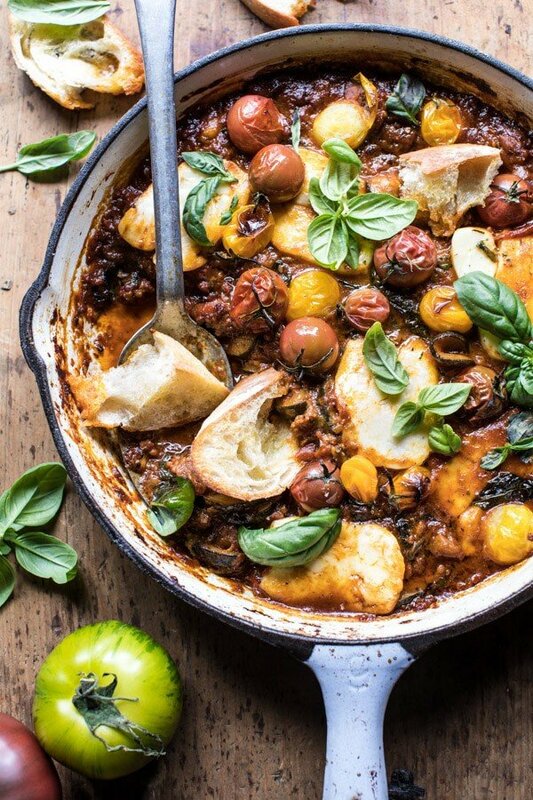 Summer Tomato and Zucchini Halloumi Bake. 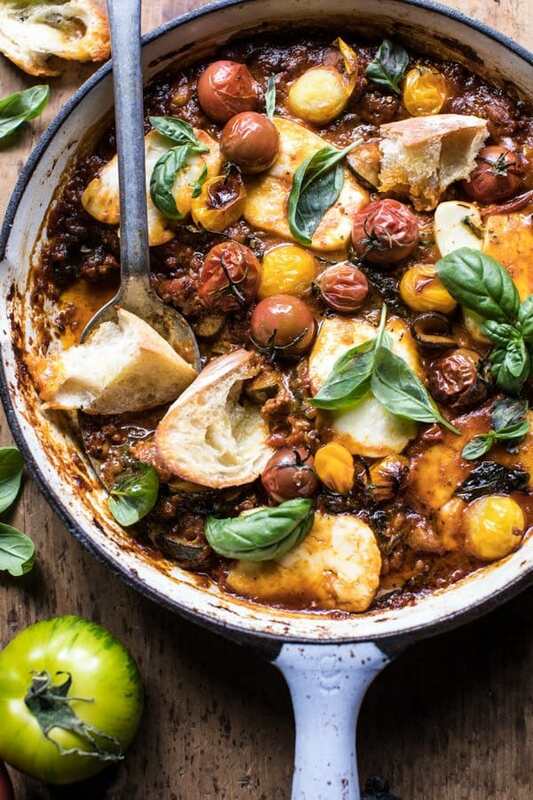 You guys, say hello to my new favorite quick and easy summertime, healthy-ish, cozy-ish dinner – the summer tomato and zucchini halloumi bake. You know, you’d think that just one of these Mondays I’d give you guys a salad recipe, huh? Ahh yeah, right. I guess that’s just not how I roll these days. No, apparently I am more into the cheesy stuff. But it’s totally cool, because we also have veggies in this dish, in the form of summer tomatoes, zucchini, and fresh spinach…you see, veggies! Aka, healthy food, aka Monday food. <–logical thinker over here…wink, wink. Speaking of which, happy Monday!! And I say that in my most cheerful of voices. I am feeling much more positive today than I have been. My goal for the week is to stay focused on doing what I love (aka working, working, working, but again I love it and I am so grateful I get to do what I do everyday). I also want to spend a few minutes each day doing something non work related and totally letting my brain think only about things that are good in the world. BIG goals, but I’m going to try. So I’m starting things off with positive vibes for you all today. Fingers crossed that you can feel it through the computer screen! In other news, we got twelve new chickens and a new little rooster over the weekend. They are about four months old and the sweetest little chickens. But um? They need to learn to go bed when it gets dark or that fox is going to get them. NOPE, not happening on my watch. I spent my Saturday night chasing around thirteen chickens and carefully placing them in their new, very safe, hen-house. Seriously, it was not fun, but I mean, gotta keep my egg layers safe! OKok, let’s chat Monday food, which for me means this fun summertime bake. Here’s the deal, I really don’t have the right words to describe just how good this recipe is because none of my usual words seem good enough at the moment. This is one of those dishes that is truly just melt in your mouth good. It feels slightly indulgent, but yet light and summery at the same time. It’s saucy with just a little bit of heat. 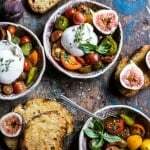 The heat is balanced with a touch of sweetness from all those tomatoes and then the dish is finished off with a subtle salty flavor from the halloumi cheese. Trust me when I say…it. is. so. good! The recipe starts off with some spicy sausage. I used a lamb sausage from Whole Foods, but if you can’t find any lamb sausage, go for a spicy Italian pork sausage. Next comes all the tomatoes. Oh my excitement for tomatoes right now is pretty much through the roof. 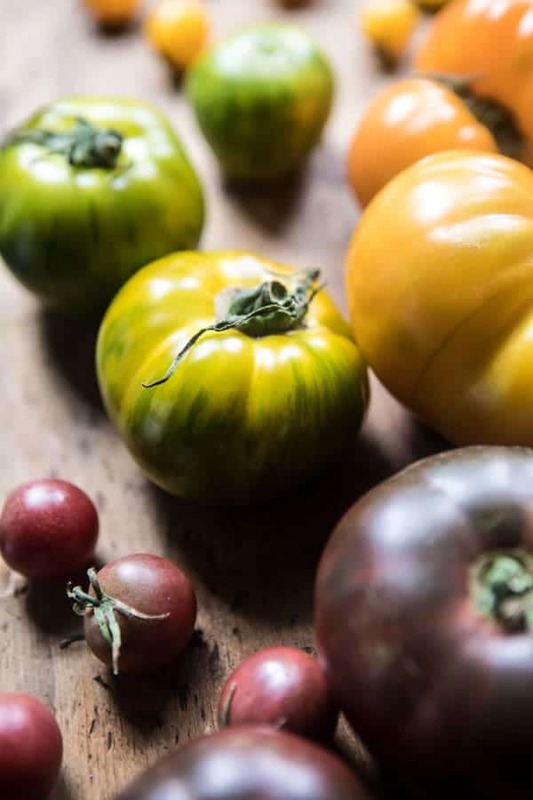 My favorite heirloom tomatoes and heirloom cherry tomatoes have finally arrived back at my local farm stand and I am basically just jumping outta my skin with happiness. So many recipes to make, not enough days in the week. Anyway, once the sausage is browned, the tomatoes get thrown in too, along with some spices, red wine (cause it’s Monday, duh) and spinach. Simmer it all for a few minutes until the tomatoes released their juices, then add some basil and layer on that salty halloumi cheese and a handful (or so) of cherry tomatoes. Bake for another few minutes, top with tons of fresh basil, and DIG IN. No utensils needed, just a side of toasted bread. Veggie Option Alert: If you want to keep this vegetarian, I recommend adding one pound of mushrooms (or really any other veggie you love) in with the onions. Adding extra veggies will take place of the meat and bulk up the sauce for you. You could also add lentils for an extra protein boost! I like to serve this with a big summer salad on the side…because you know, it is Monday. I highly recommend this simple nectarine caprese salad or this sunflower seed, kale, and cherry salad. Trust me when I say to you…this is what you need for dinner…tonight. 2. Heat a large, oven safe skillet over medium high heat. Add the sausage and onion and cook until the sausage is browned all over, about 8 minutes. Add the zucchini and cook 2-3 minutes. Stir in the tomatoes and any juices left on the cutting board. Add the paprika and season generously with salt and pepper. Stir in the wine. Add the spinach, cover and simmer 5-10 minutes or until the tomatoes are soft and have released their juices. Stir in the basil. 3. Arrange the halloumi in an even layer over the sauce. Sprinkle the cherry tomatoes over top and transfer to the oven. Bake for 10-15 minutes or until the cheese is golden and the sauce has thickened slightly. Serve warm topped with fresh basil and toast for dipping. Enjoy! With toast and wine, Happiest Monday! Hi Tieghan, I got excited when I saw this post as I have a glut of zucchini at the moment but there isn’t any zucchini in it!! Hi Liz! So sorry! I left the zucchini out by mistake, recipe is all fixed now! 🙂 Let me know if you have any other questions. Hope you love this recipe! Where does the zucchini come in? Hey Kate! So sorry! I left the zucchini out by mistake, recipe is all fixed now! 🙂 Let me know if you have any other questions. Hope you love this recipe! I hope you love it Julia! Thank you! So sorry! I left the zucchini out by mistake, recipe is all fixed now! 🙂 Let me know if you have any other questions. Hope you love this recipe! Hi, Tiegh, first of all, wonderful recipe. 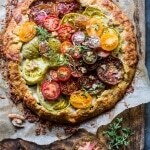 I will definitely make this because I also love tomatoes and cheese. But I am little confused. 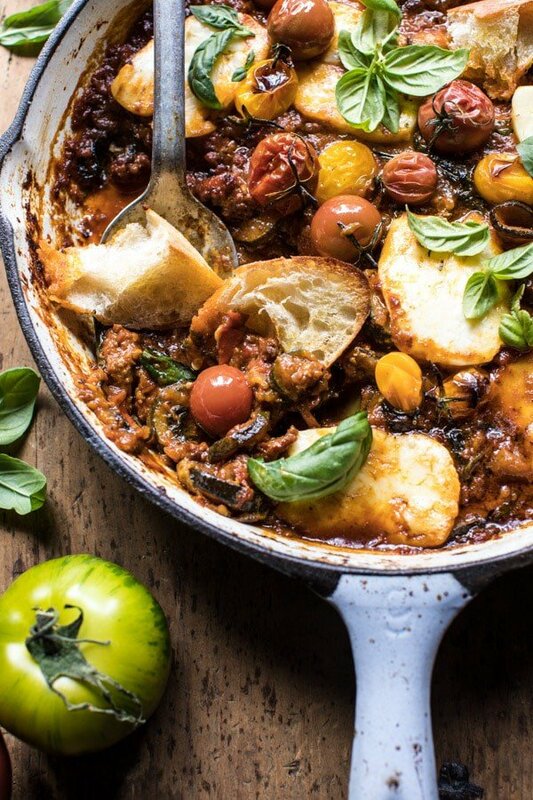 You call this dish Tomato and ZUCCHINI bake. Where is the zucchini? I cannot see that in the recipe. Thanks for the explanation and have a nice day! HI! So sorry! I left the zucchini out by mistake, recipe is all fixed now! 🙂 Let me know if you have any other questions. Hope you love this recipe! Thank you so much! No need to appologize, we are all human, we make mistakes. The recipe is great, once again, thanks for sharing it with us. The recipe title is summer tomato and zucchini halloumi bake but there is no zucchini in the recipe. Did you mean to title it summer tomato and spinach halloumi bake or is there zucchini in it and it was just missed? I use your recipes often. Yummy! Hey Mary! So sorry! I left the zucchini out by mistake, recipe is all fixed now! 🙂 Let me know if you have any other questions. Hope you love this recipe! Thanks! Where is the zucchini (courgette)? Hi Helen! So sorry! I left the zucchini out by mistake, recipe is all fixed now! 🙂 Let me know if you have any other questions. Hope you love this recipe! Thanks! Gak! I have a kid who won’t eat FRESH tomatoes. I know. Would it work if I pureed them sort of into a chunky sauce? Looks so good, want to try halloumi. Thanks. This looks delish! I am not sure I will be able to find Halloumi Cheese anywhere near me. (very rural town)… Any suggestions for a substitute? We’re huge fans of tomato bake here in my home!!! Shame I can’t find haloumi, I would de try this one. I recently was introduced to halloumi and have looking for recipes that include it. This is perfect! My tomatoes and zucchini are ripening and should be ready in a few weeks! Can’t wait to try this! 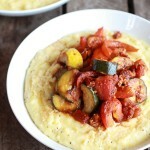 Fresh zucchini and tomatoes from your garden sounds so yum!! I hope you love this Malia! It looks so rich! And I love the heirloom tomato colors that brighten the dish up. And let’s not get me started on having delicious bread soaking up all those great flavors. I definitely need to make this! 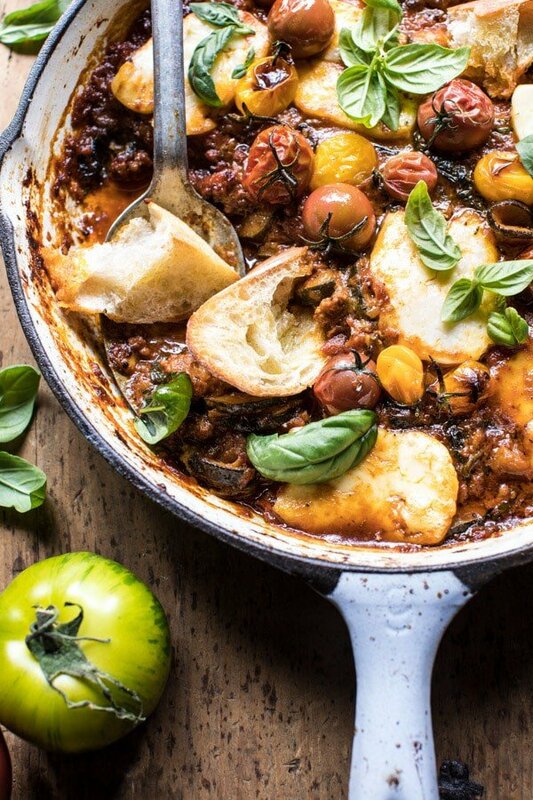 I have a ton of recipes on my site (http://www.behindtheplates.com) now in for the summer tomato season, but this will definitely be on my “to-make” list! I hope you love this recipe Missy! Thank you! Great dish, we loved it! Haha so glad it was and I am super glad you loved this! Thank you Lea! All I needed to see was zucchini, what an awesome summer comfort dinner. Thanks Matt! I hope you love this one! I’m into the cheesy stuff too Tieghan! And all the other ingredients on the list! Looks delicious! Thank you Mary Ann! I hope you love this! 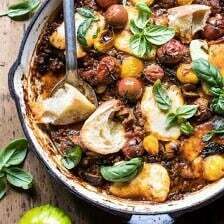 LOVING the ground spicy sausage in this! Oh my goodness… i have just finished eating this!!! Probably cooked it way longer that described but I wanted to really reduce it down which made it so gorgeous. I added more mushrooms and no meat ( veggie). Going to have the left overs with some pasta for lunches. Amazing recipe. 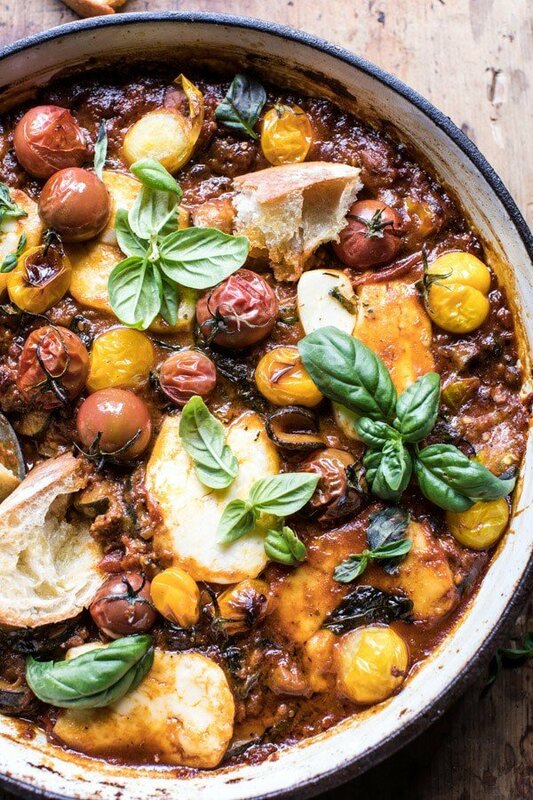 Love how you took all the seasonal summer things and baked it into this warm and cozy dish. You had me at halloumi alone but those summer tomatoes are looking mighty fine too! 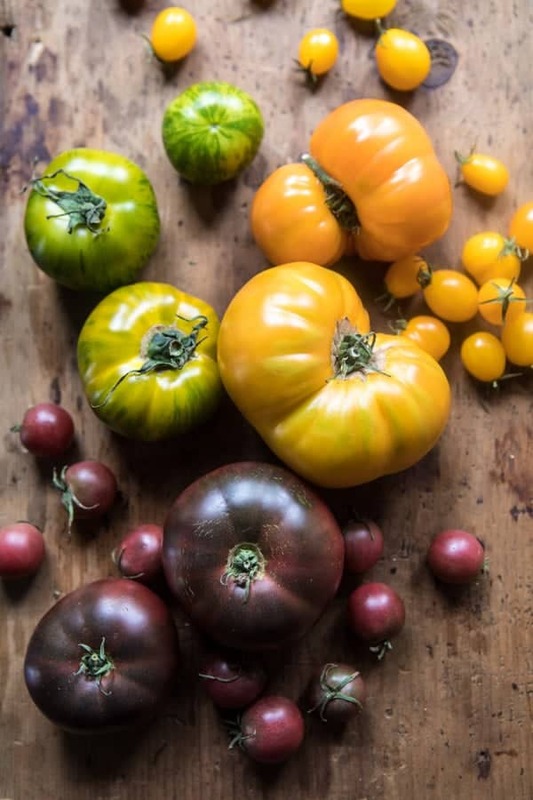 These heirloom tomato colors are breathtaking! Why I love Summer food so! And congrats on the little chicks. I bet they are precious! Thank you & they are! I hope you love this recipe! Can’t wait to try this. This looks incredible! Any suggestions for a wine replacement? Preggers :/ thanks! Simmering for 5-10 mins plus baking for 15-20 mins means all the alcohol will evaporate out of the finished dish. Don’t worry about replacing it. It looks absolutely delicious!!! The presentation of recipe shot is amazing. Thank you for sharing one of the easiest & tasty recipe. I liked it so much!!!! amazing Before I will also find the same recipe from one website sharing a link with you::: http://sooperchef.blogspot.com. Fantastic recipe, a wonderfully fresh. I cooked this recipe for the first time last night for my best friend. We ate it outside on the balcony and it was absolutely delicious. I really wish I could eat outside every evening, it is such a treat. Thank you so much for posting this. Eating outside is so perfect, I love it as well! I am so happy you loved this Dana, thank you! Made this recipe last night, with mushrooms instead of sausage, like you suggested for a vegetarian option! It was delicious! We’ll definitely be making this again. Thanks for the recipe! I am so glad it turned out amazing! Thank you Eva! Hope you love it thanks Cesar! Have you ever tried cracking an egg on top and baking? I’m considering the this delicious looking recipe as a comfort brunch item. Suggestions? Can’t wait to try! I have not, but I think that is probably the most genius idea ever. Love the sound of baking eggs over top. YUMM! Hope you love the recipe! Love that your messing with the recipe and finding your favorite variations! Always makes for the best to adjust to your own taste buds a bit! Thanks for making it Kelly! I made this for dinner tonight, modifying it with some different ingredients – Turkey sausage, 5 oz. baby kale instead of spinach, and added some garlic, oregano, onion powder, and plenty of red pepper flakes. After tasting, I added a generous amount of smoked paprika, which really put it over the top in my estimation. I cooked it all uncovered on the stovetop, fried the cheese separately and added at the end. My family raved about how good this was! AH!! SO happy you made this!! Its one of my favorites!! Everything sounds delish that you added! Thrilled the family liked it (: Thanks Diane! We had this for dinner tonight. So good! I made the vegetarian version with mushrooms. Sounds awesome, so happy you had it! Thank you! This bake is seriously everything! 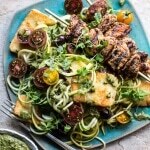 Love those gorgeous tomatoes and the halloumi (of course!). Ah yes! I’m in love with them both!! I made this tonight for my mom and she seemed to really enjoy it! Thank you for the recipe. 🙂 I left out the sausage and served it with French bread. I may need to use a different bread next time, but it was nice (although messy) to scoop up the tomatoes and cheese. Also, the halloumi was lovely (and new) and went well with some red wine while watching Harry Potter. 😉 thank you again! SO happy you mom liked it Kristin! Ah yes a thicker bread would work much better even though french bread is delicious! Sounds like an amazing dinner/night! I made this dish tonight along with the nectarine and fried mozzarella salad and omg…it was amazing! I’ve made quite a few of your recipes and every single one of them are always bursting with flavor and taste, and these two dishes were no exception. The base of this zucchini bake is so simple but the red wine addition really kicked it up a notch (tbt emeril lagasse). I’ve remained a silent observer over the years but tonights meal was so good that I felt compelled to leave a comment. Awh, thank you so so much Jessica! Made my morning with this comment! Thank you so much for leaving the comment! Thank you Mia, spent lots of time finding them! Hi Mariana, thank you so much for making it! SO so happy everyone like it, and very interesting to hear where they felt it reminded them of! I made this Friday night and it was delicious! I couldn’t find lamb sausage so I used a mix of half pork sausage and half ground lamb which was perfect. And a “bake at home” loaf of ciabatta plus a bottle of pinot noir rounded it off perfectly! Lamb/pork, sounds delish!! So happy you liked it, thank you Linda! Simply awesome. Wow. We loved it. Thank you again and again! So happy you enjoyed it David, thank you! I am really glad you liked this! Thank you! So, so yummy. Made it for my other half for dinner this evening, and it was a huge success. Wasn’t able to get lamb or spicy pork sausages at my local shops, so bought classic Italian sausages (pork and beef) and cooked all the way through in the oven as I don’t have anything that can go on both the stovetop and oven right now (I’m in the middle of moving house!). SO YUMMY!!! I am so glad you enjoyed this Morgan! Thank you! Love this dish and the cleanup was a breeze! I followed the recipe except that I used goat cheese instead of the halloumi. YUM! I am so glad you loved this recipe Louise! Another winner! Your recipes bring excitement to my vegetable garden! Keep them coming!